James Pethokoukis is a columnist and blogger at the American Enterprise Institute. Should we be so pessimistic about the role of technology in our lives? Has 5G been overhyped? And when will autonomous cars be a reality for consumers? On this episode, Andreessen Horowitz’s Benedict Evans discusses why we respond the way we do to technological change and where the tech industry is taking us next. Benedict Evans is a partner at the Silicon Valley venture capital firm Andreessen Horowitz (‘a16z’) and also runs a popular email newsletter. Does allowing Huawei to build Europe’s 5G network pose a threat to international security? And to what lengths should the US go to help Huawei’s European competitors? On this episode, AEI’s Claude Barfield discusses the race to build the world’s 5G backbone and how the Trump administration should police Chinese intellectual property theft. Claude Barfield is a resident scholar at AEI and a former consultant to the office of the US Trade Representative. He has written extensively about 5G, China, and Huawei. Will artificial intelligence (AI) lead to a jobless economy? Can AI stimulate lasting economic growth? Is anti-competitive behavior by big tech slowing the rate of AI innovation? On this episode, Professor Robert Seamans discusses AI’s impact on the economy, how it will change the nature of work, and whether regulation is needed to keep the AI industry competitive. Robert Seamans is an associate professor at New York University’s Stern School of Business and a former Senior Economist at the White House Council of Economic Advisors. Most recently, he coauthored the chapter “AI and the Economy” with Jason Furman. Who’s protecting the consumer in the age of Big Tech? Has Big Tech become a barrier to innovation? Who owns the data you generate while surfing the web? And should you get paid when a company uses that data for targeted ads? On this episode, Neil Chilson discusses the economics of privacy, the complexities of content moderation, and whether Big Tech has become anticompetitive. Neil Chilson is a former Federal Trade Commission (FTC) acting Chief Technologist and a current senior research fellow for technology and innovation at the Charles Koch Institute. Prior to joining the FTC, Chilson practiced telecommunications law at Wilkinson Barker Knauer, LLP. Ever since the new Democratic majority was seated in the House and the 2020 Democratic presidential primary got underway, numerous proposals have emerged to increase taxes on America’s wealthiest. But is a two percent tax on wealth over $50 million as small as it sounds? And what are the disincentive effects of Rep. Alexandria Ocasio-Cortez’s 70% top tax rate? On this episode, AEI’s Alan Viard walks us through how to think about some of the new tax policy proposals emerging out the Democratic presidential primary race. Alan Viard is a resident scholar here at AEI, where he researches federal tax and budget policy. He earned his PhD in economics from Harvard University, has worked as a senior economist at the Federal Reserve Bank of Dallas, and was a senior economist at the White House’s Council of Economic Advisers. On this episode, podcaster and serial entrepreneur Brian McCullough discusses the rise of the early internet companies, the dot-com bubble, and whether today’s Big Tech companies poses a threat to Silicon Valley’s tradition of innovation. Byron Reese, author of the new book “The Fourth Age: Smart Robots, Conscious Computers, and the Future of Humanity,” organizes human history so far by framing it around three main inventions. We entered the first age when we learned to harness fire and language, the second when we mastered agriculture, and the third came with the invention of writing and the wheel. Now we are on the verge of a fourth age, thanks to developments in artificial intelligence, and to hear Reese tell it, this fourth age promises to be just as transformative as its predecessors. Byron Reese is the CEO and publisher of the technology research company Gigaom, and the founder of several high-tech companies. For several years now, we have heard economic commentators proclaim the United States had reached “full employment.” And yet the economy just kept adding jobs and the unemployment rate kept falling. One economist who has consistently opposed that prognosis is Adam Ozimek, and it appears he’s been vindicated. So I invited him on the show to talk unemployment, wage growth, and all things economic policy. We also cover the jobs guarantee proposal, inflation, and Dr. Ozimek’s one out-of-the-box idea to boost US economic growth. Is Silicon Valley home to this century’s robber barons? The denizens of Silicon Valley (and Seattle) have picked up a slew of nicknames: GAFA (for Google, Apple, Facebook, and Amazon); FAANG (add Netflix in there); or, most ominously, the Frightful Five (sub out Netflix, sub in Microsoft). The central charge is these firms are monopolizing their respective markets, and have achieved such dominance that their market positions are now unchallengable. The side effects may include dampened innovation, reduced labor power, and any number of democracy-is-in-peril concerns. But my guest this episode, antitrust expert Nicolas Petit, argues against this alarmist case against the tech titans. Drawing from his 2016 paper, “Technology Giants, the Moligopoly Hypothesis and Holistic Competition: A Primer,” as well as new research from a forthcoming book, Petit makes the argument these “Frightful Five” firms engage in cutthroat competition with one another, benefiting the economy as a whole — and government regulation against these companies is premature. But with President Trump’s trade war so far refusing to relent, is this vision of a free-trading future far too sanguine? Irwin himself joined me to discuss this question, as well as some American economic history, the most pervasive myths people believe about trade policy, and much more on the most recent episode of my podcast. Cutting every citizen a monthly check, regardless of whether they work, is no longer as radical an idea as it once seemed. Some form of government-ensured universal basic income — or UBI, as it is more commonly known — is now embraced by some libertarians, futurists, and (of course) socialists. But that’s not to say UBI has grown uncontroversial. It has, however, grown more politically feasible, as the Overton window continues to widen. The dawn of the Asian century, or the end? The backdrop to the escalating US-China trade — and what gives it a salience our squabbles with the EU, Mexico, and Canada lack — is the sense that China is not only an economic rival but also an ideological and military threat. And, exacerbating concerns, the sense that China is rising inexorably, so much so that just as the 20th was “America’s century,” the 21st will belong to China. So with this on the mind, it seems a good time to revisit my 2017 conversation with Asia expert Michael Auslin, author of “The End of the Asian Century: War, Stagnation, and the Risks to the World’s Most Dynamic Region.” In this episode we discuss his book, the past and future of the Asian economies, how the US should respond to China’s rise, and much more. 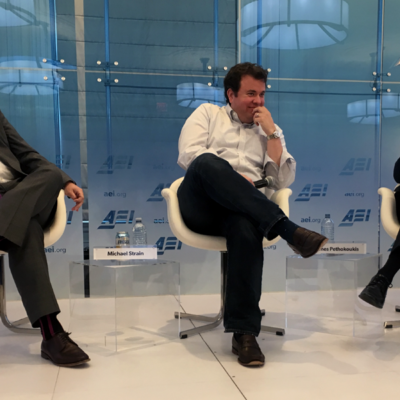 Find the transcript of our conversation on AEI’s blog, here. The Tax Cuts and Jobs Act passed in December has been credited for kick-starting economic growth and boosting workers’ wages. It’s also been blamed for enriching the already well-off at the expense of labor, and for dooming us all to a life of perpetual deficits. Its supporters tout the bonuses many firms doled out in January as evidence of its success. Its opponents point to stock buybacks and increased dividends paid out to shareholders as proof of its failure. But what can we really say about the tax law at this point in time? To break it all down, I’m joined by AEI tax expert Alan Viard. He earned his PhD in economics from Harvard University, has worked as a senior economist at the Federal Reserve Bank of Dallas and the White House’s Council of Economic Advisers, and has forgotten more about tax policy than most people will ever know. In this episode, we discuss the book the Financial Times calls “the future of growth theory,” and discuss everything from economic development to America’s big tech firms to Friedrich Hayek. In April 2016, when dinosaurs roamed the earth and Donald Trump was still just one among several contenders for the GOP nomination, I talked with AEI trade expert Claude Barfield about trade deficits, the WTO, US-China relations, and more. Two years later, our conversation may be even more relevant now than it was then. Claude Barfield is a resident scholar in international trade policy, science, and technology at the American Enterprise Institute. Before coming to AEI, he was on the faculties of Yale and the University of Munich, and worked at the National Journal; in the Department of Housing and Urban Development; the Senate Governmental Affairs Committee; and as a consultant to the office of the US Trade Representative. What is driving America’s housing crisis? The United States is in the grip of a housing affordability crisis, especially in its high-productivity cities like San Francisco, Seattle, and New York. In addition to harming individuals, this is also having a deleterious effect on the country’s economic growth. But what is behind this problem, and what can be done to remedy it? Lynn Fisher joins the podcast to discuss. Dr. Fisher recently joined AEI as a resident scholar and co-director of the Center on Housing Markets and Finance. Before this she served on the faculty at Washington State University and the University of North Carolina, and was director of the Housing Affordability Initiative at MIT. Is capitalism just not radical enough? This episode’s guest advocates abolishing private property as we know it and ditching one person democracy, one vote democracy. And he does this in the name of saving capitalism and a just, democratic society. His name is Glen Weyl, co-author with Eric Posner of the new book “Radical Markets,” and he joins me to discuss his main arguments and convince me such radical steps are necessary at a time of steady economic growth and falling unemployment. Agree or not, it’s a fascinating discussion. With the United States and China trading threats of escalating tariffs, the world waits to see whether these barbs become a full-fledged trade war between the two largest economies. The Trump administration claims its actions are necessary to deter China from continuing its predatory trade behavior — an objective today’s guest, Derek Scissors, agrees is a worthwhile pursuit — but he doubts whether the means Trump has chosen can achieve this end. Over the course of our conversation we discuss the likely impact of Trump’s promised tariffs, the different ways China cheats the global trading system, whether the US should have allowed China to join the WTO in the first place, and much more. Derek Scissors is a resident scholar here at AEI, the chief economist of the China Beige Book, the author of the China Global Investment Tracker, and an all-around expert on US-China relations. Machine learning is something new under the sun: a technology that builds itself. Right now we have limited algorithms with limited potential, but, if it exists, the Master Algorithm could derive all knowledge in the world from data. Inventing it would be one of the greatest advances in the history of science, speeding up the progress of knowledge across the board and changing the world in ways we can barely begin to imagine. So says Pedro Domingos, professor of computer science at the University of Washington and author of the book “The Master Algorithm: How the Quest for the Ultimate Learning Machine Will Remake Our World.” He joined the podcast to discuss his book and the possible utopian and dystopian futures of AI. 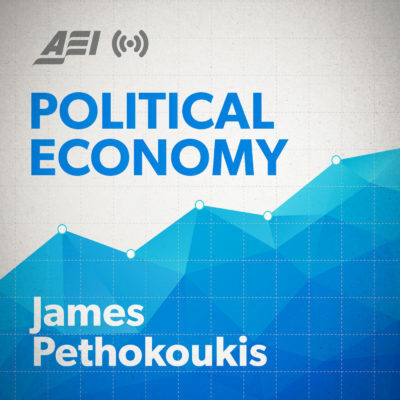 For the 100th episode of the Political Economy podcast, James Pethokoukis sat down with Michael Strain and Stan Veuger during the Ricochet – AEI Podcast Summit in Washington, DC.